In that same Cathedral is the beautiful stained glass window by Henry Haig entitled 'Pentecost', symbolising the event recounted in Acts 2: 1 - 11. I love it! 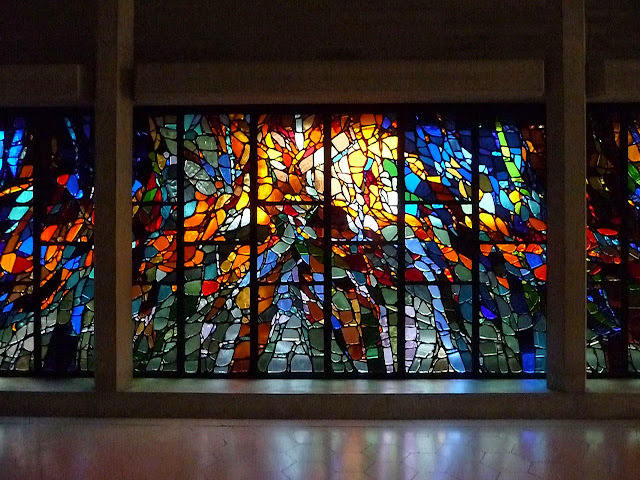 There is also another window by the same artist called 'Jubilation', symbolizing the joy of the Holy Spirit. Pentecost ('Whit Sunday'), at the end of the 50 days of Easter, is sometimes called 'the birthday of the church' because the apostles were empowered to proclaim the good news of Jesus and the community of Jesus' followers grew fast from that day. Some churches have a birthday cake with candles at Pentecost to celebrate and share. Much fun can be had with blowing out the candles, especially if they are the the re-igniting variety. However hard you try you cannot extinguish the Spirit of Jesus. The Holy Spirit cannot be controlled, but can be welcomed. Our little flames of faith can flicker and dim, but they can be relit or fanned into flame and that is part of the point of celebrating the Feast of Pentecost.